In the unlikely event of a snow load testing the strength of your roof, use a snow rake to lighten the load up there. When it comes to snow on the roof, how much is too much? That depends a lot on the way your roof was constructed. Steep and smooth roofs tend to shed snow loads easily, while roofs that are only slightly pitched or flat tend to collect big drifts. Another important factor is the weight of the snow. Half a foot of wet snow tips the scales about the same as a yard or more of fluffy flakes. If you have a multi-story house, you’d best hire a licensed and insured pro who has the right equipment to get the job done right. 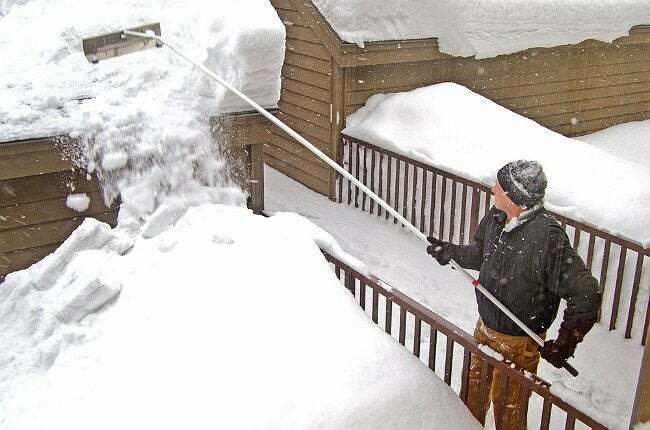 On the other hand, if you have a single-story home, you can pull snow off the roof with a long, telescoping snow rake. Look for sturdy models with small rollers that keep the edge of the rake away from your shingles—you don’t want to damage those. Finally, before you start pulling snow off the roof, put some thought into where the snow’s going to land. You’ll want to pick a spot other than on your head or the heads of bystanders!